Not so long ago—a blink of an eye on the geological time scale—Turkey Vultures soared only over southern landscapes. Today, you can spot them from Maine and Ontario to Montana, Saskatchewan, Manitoba, and even north and west to Vancouver Island, British Columbia. 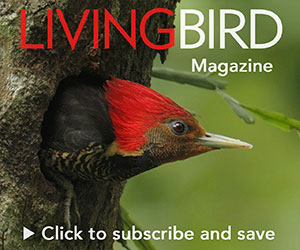 They are part of a cluster of “southern species”—Red-bellied Woodpecker, Tufted Titmouse, Northern Cardinal, Northern Mockingbird, and Carolina Wren—that have pushed their ranges hundreds of miles north in recent decades. A century ago, all were far more numerous south of the Mason-Dixon Line than north of it. Today, all are common throughout most of New England and other northern states west to the Great Lakes, and three of them—Turkey Vulture, cardinal, and mockingbird—now nest regularly in Canada. The idea that a warming continent might cause such a movement dates back at least to 1909, when Philadelphia ornithologist Spencer Trotter published “The Geological and Geographical Relations of the Land-Bird Fauna of Northeastern America” in The Auk. Trotter had a much different understanding of climate change than we have today. In his view, the three recognized avian faunas of the day—the “Canadian,” the “Alleghanian,” and the “Carolinian”—had followed one another to the northeastern corner of the continent in a slow and stately pageant. They had moved, he believed, in response to “a general tendency of various species of birds to spread gradually northward into a region of new environing conditions which has been opened to them since the Glacial Period.” After the ice receded and conifers took hold, Golden-crowned Kinglets, Pine Grosbeaks, redpolls, juncos, and other Canadian species had pushed in first. Much later, as the habitat changed still more, bluebirds, goldfinches, Chipping Sparrows, Rose-breasted Grosbeaks, Red-winged Blackbirds, and other Alleghanians moved in. Finally, in the first decade of the 20th century, the Carolinian species, the “laggards,” seemed poised to colonize the Northeast. Trotter listed the Tufted Titmouse, Northern Cardinal, Carolina Wren, and Turkey “Buzzard” as species on their way—and he has been proven correct in each case. Maybe it’s a little too obvious. It is true that white-tailed deer populations have exploded over the same decades that vultures have moved northward. From a population of about half a million in 1900, white-tailed deer now number at least 15 million and, according to some estimates, well over 20 million. They have become a scourge for gardeners, farmers, foresters, park rangers, and drivers. The National Highway Traffic Safety Administration recently concluded that the 1.5 million accidents involving vehicles and deer, 150 human fatalities, 10,000 injuries, and one billion dollars in damages recorded each year represent only a fraction of the damages because countless accidents go unreported. Despite these statistics, however, I have begun to wonder whether our birders’ sense that vultures depend on deer carcasses might be based on a kind of optical illusion. Yes, we all see lots of road-killed deer and, yes, sometimes we see vultures standing alongside the carcasses and occasionally even feeding on them. But, how often do we identify the smaller, squishier road-kills vultures also feast on? And how much do we know about the carrion that vultures find away from roadsides? In their 1998 Birds of North America monograph on the species, David Kirk and Michael Mossman note that Turkey Vultures feed “opportunistically on [a] wide range of wild and domestic carrion,” including mice, shrews, deer, pigs, sheep, chickens, blackbirds, snakes, turtles, shrimp, snails, grasshoppers, mayflies, coyotes, sea lions, and more. They also eat cow manure and rotten pumpkins. The feeding habits of vultures are commonly studied by collecting and analyzing the birds’ regurgitated pellets. A browse through the literature suggests that deer kills are not as crucial a component in vultures’ diets as birders might expect. A 1984 study of vultures in Virginia published in The Wilson Bulletin found that the remains of sheep (in 55 percent of all pellets) and opossum (in 51 percent) outnumbered deer remains (32 percent). A 1989 study, “Food Habits of Turkey Vultures in West Texas,” published in The Journal of Raptor Research, found deer remains in fewer than 8 percent of the pellets collected. By contrast, skunk remains were found in 37 percent and rabbit remains in 89 percent. Another study published in The Wilson Bulletin (1990) found that in Maryland and Pennsylvania, where white-tailed deer are especially abundant, vultures fed on both domestic poultry (64 percent of all pellets) and domestic animals (50 percent) more often than on deer (40 percent). Another 1990 article in The Wilson Bulletin, “Turkey Vulture Food Habits in Southern Ontario,” reported that vultures at the roosts studied had fed on a wide mix of 19 mammals, both domestic and wild, as well as on beetles and chickens. Woodchuck was the most widely taken food, present in 53 percent of the pellets. White-tailed deer did not even make the menu. 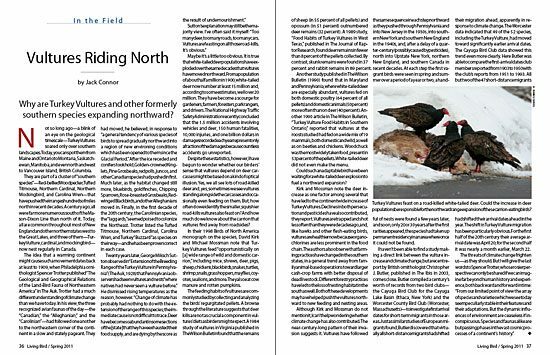 Could such an adaptable bird have been waiting for a white-tailed deer explosion to fuel a northward expansion? Kirk and Mossman note the deer increase as one factor among several that have led to the continentwide increase of Turkey Vultures. Declines in both persecution and pesticides have also contributed, they report. Vultures are trapped and shot less often than they were decades ago, and, like hawks and other flesh-eating birds, vultures are healthier now because organochlorines are less prominent in the food chain. The authors also observe that farming practices have changed in the southern states, in a general trend away from family animal-based operations toward larger cash-crop farms with better disposal of dead livestock. Different forestry practices have led to the loss of nesting habitat in the south as well. Both of these developments may have helped push the vultures northward to new feeding and nesting areas. Although Kirk and Mossman do not mention it, I can’t help wondering whether climate change has also contributed. The near-century-long pattern of their invasion suggests it. Vultures have followed the same sequence in each step northward as they pushed through Pennsylvania and into New Jersey in the 1930s, into southern New York and southern New England in the 1940s, and, after a delay of a quarter-century (possibly caused by pesticides), north into Upstate New York, northern New England, and southern Canada in recent decades. At each step the first vagrant birds were seen in spring and summer over a period of a year or two, a handful of nests were found a few years later, and soon, only 20 or 30 years after the first rarities appeared, the species had taken up permanent residency in an area where once it could not be found. I haven’t been able to find a study making a direct link between the vulture increase and climate change, but a recent report by British ornithologist Christopher J. Butler, published in The Ibis in 2003, comes close. Butler compiled a century’s worth of records from two bird clubs—the Cayuga Bird Club for the Cayuga Lake Basin (Ithaca, New York) and the Worcester County Bird Club (Worcester, Massachusetts)—to investigate first arrival dates for short-term migrants in those areas. Just as similar studies of European migrants found, Butler discovered that virtually all short-distance migrants had shifted their migration ahead, apparently in response to climate change. The Worcester data indicated that 49 of the 52 species, including the Turkey Vulture, had moved toward significantly earlier arrival dates. The Cayuga Bird Club data showed this trend even more clearly. Here Butler was able to compare the first-arrival dates club members reported from 1903 to 1950 with the club’s reports from 1951 to 1993. All but two of the 47 short-distance migrants had shifted their arrival dates ahead in the year. The shift in Turkey Vulture migration has been particularly obvious. For the first half of the 20th century their average arrival date was April 20; for the second half it was nearly a month earlier, March 22.